When most of us think of bank stocks, we’re generally not saying positive things. We have a bad taste in our mouth, particularly since early last year. But this is not the case in India. Look at this chart. Which one is different? 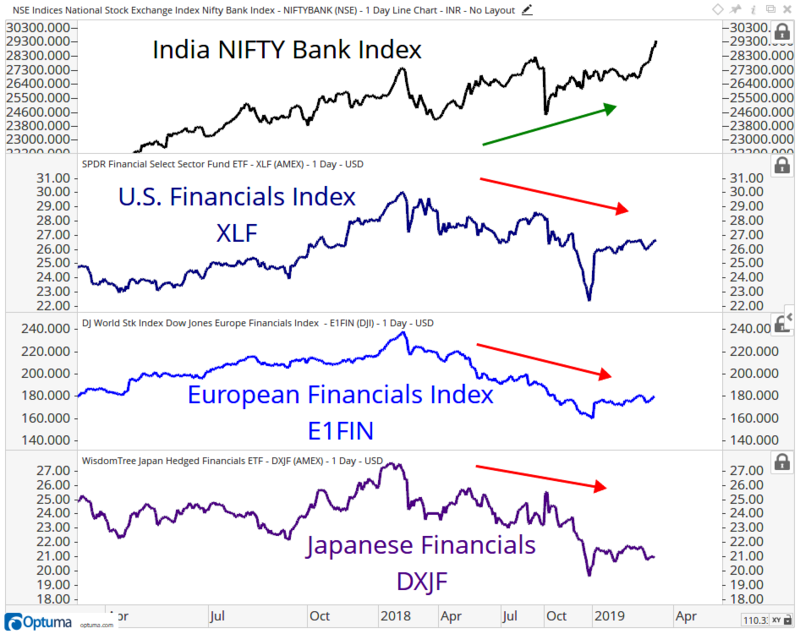 The outperformance from Indian banks compared to those of Japan, Europe and the U.S. says a lot about that relative strength. I have a funny feeling later this year and next we will be pointing to this relative strength as a heads up of outperformance from this space. I think that also says a lot about risk appetite for stocks in general, especially emerging markets (“3 Strong Pieces of Evidence for the Bulls,” Feb. 13, Big Market Trends). Do India’s banks catch down to the others? Or do we see rotation into bank stocks in these other countries, and it’s just that India is the leader? I think there’s a higher probability the answer is the latter. Speaking of India, I recently sat down for a live interview with ET NOW, India’s leading business news channel. It’s amazing that I could not live further away than I currently do, yet we can still do this sort of thing. Their morning TV is my evening, but it works. It also tells you that technical analysis can work anywhere. 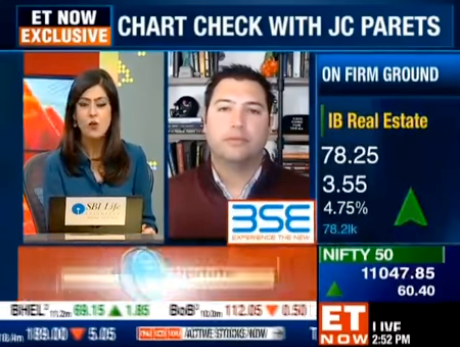 In this interview with Aabha Bakaya, I discuss the ongoing range-bound market in U.S. stocks and then we shift gears to India’s stock market. We talk about the rotation into small- and mid-caps, key levels for both the NIFTY 50 and Bank NIFTY, as well as the relative strength we’re seeing in the bank stocks, particularly ICICI and AXIS Bank. You’ll hear me talk about risk management, India-style. Where I live out west, the work hours and lifestyle are much better. But damn I can’t for the life of me get a decent bagel or slice of pizza. And then there are the rest of the states. What say you? Email me at bigmarkettrends@charlesstreetresearch.com.